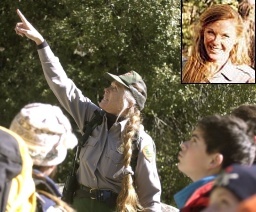 This wild places program is a thanks and tribute to Yosemite National Park's wilderness manager, Ranger Laurel Boyers. Ranger Boyers is retiring from the park after 31 years of service on October 1st. We hear from Mike Tollefson, the superintendent of Yosemite National Park. Mike comments on Ranger Boyers' Career. Steve interviews Laurel Boyers, who talks about her experiences in the span of her career. We understand that Laurel Boyers and her husband, also a park service employee, will soon be taking some time to visit other national parks. We thank her for her service in the interest of preserving Yosemite's wilderness, and wish her the best in her future adventures and endeavors. A Berkeley-based publisher of outdoor guidebooks and maps for California and beyond. From the peaks of Yosemite to the stairways of San Francisco, we've helped people find their way in the outdoors for over 40 years. 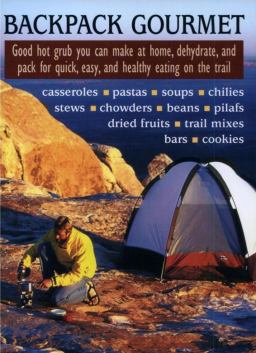 This skills program is a guide to cooking and dehydrating a gourmet bouillabaisse soup for your backcountry trips. A lot of people think you can't take food this good on the trail. Steve visited the kitchen of backcountry cooking author Linda Frederick Yaffe. Ms. Yaffe is the author of the books Backpack Gourmet, Solar Cooking for Home and Camp, High Trail Cookery, and The Well Organized Camper. Our guest backpack gourmet gives us an introduction to dehydrating our own meals from gourmet recipes and ingredients. Listen to this show, and learn how to make four servings of delicious soup fit in a small plastic bag weighing four ounces per serving. Follow the supplemental information link, below, to get the complete recipe, and pictures of the soup. We'll hear more from Linda Frederick Yaffe in a future program. WildeBeat members can download a longer extended version of the interview from the WildeBeat Insider web site. This wild places program is part two of an exploration on how the job of wilderness rangers is changing. (Listen to part 1 first.) Many people who worked for parks and forests when the Wilderness Act went in effect are still working. Last week, we started out by getting a look at the traditional skills and duties of a wilderness ranger. This week, we find out about the greatest changes affecting their jobs, and changes in the way we interact with them. Gregg Fauth, Wilderness Coordinator for Sequoia and Kings Canyon National Parks. Laurel Boyers, Wilderness manager for Yosemite National Park. 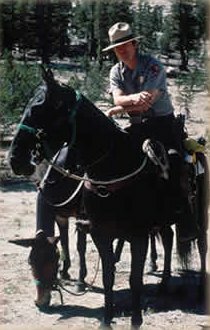 Don Mason, seasonal patrol ranger for the Lassen National Forest. Steve Zachary, the education specialist for Lassen Volcanic National Park. What do you expect from wilderness rangers? You can share your opinions with your fellow listeners anytime using our toll free comment line at 866-590-7373. This wild places program is part one of an exploration on how the job of wilderness rangers is changing. Many people who worked for parks and forests when the Wilderness Act went in effect are still working. John Roth, Chief Ranger for Lassen Volcanic National Park. Brian Palmentier and Michelle Minnehan, experienced hikers and climbers from San Francisco, visiting the Tuolumne Meadows Wilderness Office in Yosemite. Next week, in part two, we find out about the changes in government, in environmental threats, and in the wilderness users are affecting the job of wilderness rangers. In this program we take you behind the scenes to learn about how we put together our shows. Just what goes into producing an edition of the WildeBeat? From fixing your feet to using your head, from camping in the snow to backpacking in the desert, we've spent two years finding ways to help you get into the wilderness. The WildeBeat is a free public service to help you discover, and get the most out of America's wild public lands. And while the show is free to you, it costs us a lot to bring it to you. With your support, we can continue to bring you our weekly features. Without it, we'll have to cut back on what we're doing -- a lot. Please join us, and give us the support we need to bring you the next hundred editions of the show. This wild places program is part one of a visit to the Thousand Lakes Wilderness in the Lassen National Forest. This small, 25 square-mile wilderness shouldn't be judged by its size. The Thousand Lakes Wilderness is just north of Lassen Volcanic National Park, which we explored in our edition numbers 96 & 97. 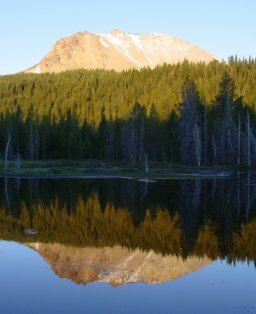 While national parks are high-profile places that attract a lot of attention, nearby national forest wilderness areas are often overlooked. Steve talks with Jan Sorochtey, the recreation officer for the Hat Creek District of the Lassen National Forest. Steve hikes to the largest lake in the wilderness, Eiler Lake, with patrol ranger Don Mason. They encounter an over-used campsite on the lake shore. 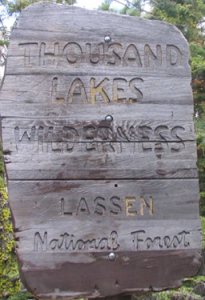 If you want to plan a trip to the Thousand Lakes Wilderness, you should start by contacting the Hat Creek Ranger District of the Lassen National Forest. Jan Sorochtey says that they don't require any permits. But take note, there is a complete campfire ban for the summer and fall of 2007. In this week's edition number 99, Andy Mytys of BackpackGearTest.org described the SPOT Satellite Messenger as a potentially cost-effective alternative to the Personal Locator Beacons (PLBs) that Doug Ritter of the Equipped to Survive Foundation recommended in our edition numbers 78 & 79, titled Counting Up Essentials. The SPOT Satellite Messenger, as well as a conventional PLB, are devices that are designed to summon search and rescue services in life-threatening situations. They're proven to be more reliable in remote locations where more conventional communication techniques might be ineffective. Andy's preliminary impressions of the product, before actually having one to test, is that it promises to provide more user-friendly features than a PLB, for less than a quarter of the price. While it's too soon to tell whether this claim is true, or too good to be true, Doug Ritter has published a more thorough analysis of this product. If you want to know more, you can read Doug Ritter's article, First Look, SPOT Satellite Messenger. This gear program is an overview of some of the new gear exhibited at the 2007 Outdoor Retailer Summer Market. Steve intervews testers from BackpackGearTest.ORG in Salt Lake City, Utah. Andy Mytys comments on the SPOT Satellite Messenger, new tarps by Go Lite, and new products by Sea to Summit. Jennifer Koles comments on the Magellan Triton GPS receiver and National Geographic Topo! maps. Jason Boyle comments on a new eVent® jacket by Rab, new drinks by Cliff Bar, and jackets by Mont-Bell. Andy talks about the green trend he saw in new gear this year. If you're interested in reviewing for Backpack Gear Test (BGT), read: How to become a tester. Manufacturers provide more gear than the volunteers at BGT can keep up with. By becoming a tester, you can get free gear, and help your fellow wilderness travelers evaluate what gear will work for them. This skills program is an interview about backcountry water quality in general, and about California's Sierra Nevada in particular. Steve interviewed Dr. Robert Derlet. Dr. Derlet is a professor of emergency medicine at the University of California Davis Medical Center in Sacramento. 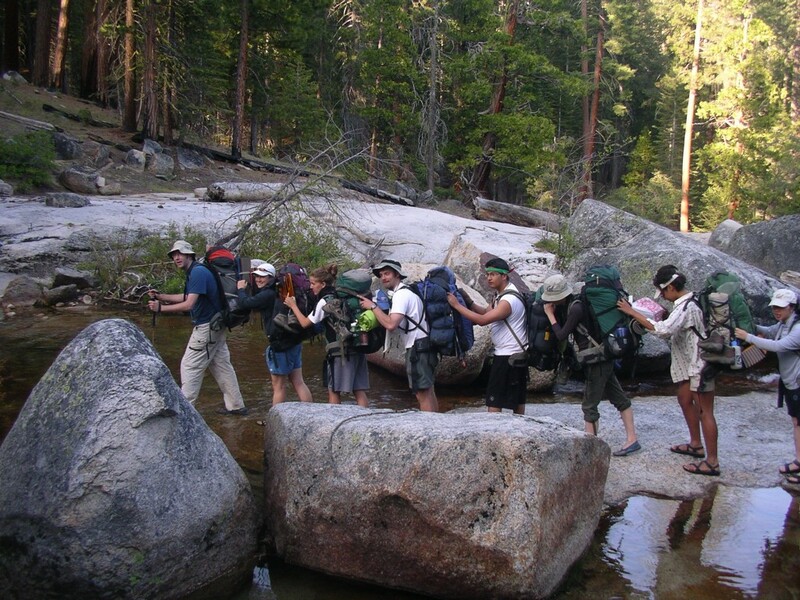 Dr. Derlet is also a recognized researcher and expert on the quality of backcountry water in the Sierra Nevada. 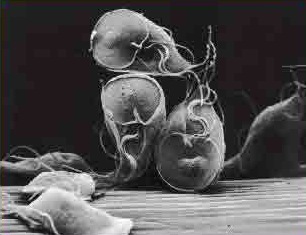 His latest paper on the subject is titled, Coliform bacteria in Sierra Nevada wilderness lakes and streams: what is the impact of backpackers, pack animals, and cattle?. In this interview, Dr. Derlet talks about how he tests water quality, what kinds of problems lurk in our water, about the various purification treatments for backcountry water, and some tips on choosing a good water source. We'll hear more from Dr. Derlet in a future program. WildeBeat members can download a longer extended version of the interview from the WildeBeat Insider web site. KTIM: 101.9FM in St. George, Utah. Heard twice a day on Thursday, Saturday, and Sunday. KVMR: 89.5FM in Nevada City and 105.1FM in Truckee, California. Heard on Tuesday afternoons between 1:30 and 2:00 p.m. If you'd like to hear the Wildebeat on your local public, community, or college station, please let them know, and then let us know. This wild places program is part one of a visit to Lassen Volcanic National Park. It's been called a little Yellowstone because of its wilderness and its volcanic features. We hear from Steve Zachary, the park's education specialist, about some of the most interesting features of the park's wilderness areas. He mentions the Cinder Cone, the Fantastic Lava Beds, and Boiling Springs Lake. Jean Higham, our normally silent co-writer and co-editor, provides a trip report on her four day hike in the backcountry. A map and pictures of her trip are available on the photo album link, below. Jean's hike was relatively easy, and she never got more than a few miles from the road. You don't have to get very far into the wilderness to have an extraordinary experience. 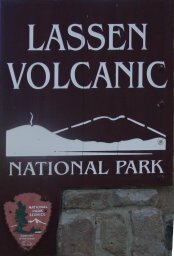 If you want to plan a trip to the backcountry of Lassen Volcanic National park, you'll, of course, want to start with this PDF map. 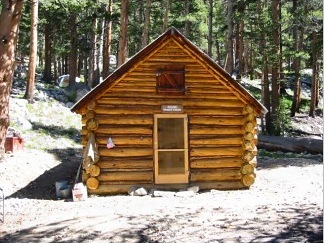 Then you'll want to contact the park to arrange for a wilderness permit. You can apply for one in-person, by phone, or online. Jean Higham, our normally silent co-writer and co-editor, takes off for four days of solo backpacking in the park's wilderness. Steve talks to Steve Zachary, the park's education specialist, about some of the features that attract people to the park. Of course, one of the most prominent is the peak of the volcano itself. Steve checks-in with Jean's progress on the trail by radio. Next time, in part 2, we'll find out more about why the backcountry features are even more fantastic than the front country features of the park, and get a report on Jean's adventure. This skills program presents the Leave No Trace skills for minimizing our impact on wilderness areas. This is a remix of our show number 4 of July 18, 2005. Steve encountered hikers on the trail last week in the Lassen National Forest, and tested them on their knowledge of Leave No Trace principles. Then we replay portions of our 2005 interview with Ben Lawhon, the education director of the Leave No Trace Center for Outdoor Ethics. Ben quizzes Steve on his low-impact wilderness skills. The Leave No Trace organization offers hundreds of training classes around the country, ranging from two hour introductions to week-long master classes. They have partnerships with parks, equipment manufacturers, commercial outfitters, major media outlets, and small non-profit organizations like ours. Check the training schedule on their web site for opportunities to learn these minimum impact skills from a qualified volunteer. This skills program is a look at the arms race between campers and bears in Yosemite and the Sierra Nevada. How should you protect your food from bears? This is a reprise of our show number 48, first presented on June 29, 2006. We include excerpts from interviews with Tori Seher, the wildlife biologist in charge of human/bear management at Yosemite National Park, and Laurel Boyers, the Wilderness Manager at Yosemite. They talk about the history of keeping bears from camper's food in the Sierra Nevada, and the destructive effect that human food has on Yosemite's bears. They also give advice on dealing with bear encounters. You can find out more about bears in the Sierra Nevada and the site SierraWildBear.GOV, which is jointly operated by the park service and the forest service. This gear program presents reviews of wool-blend socks. You probably don't think much about socks, until you find yourself wishing you had different ones. Andrew Buskov reviews the Bridgedale X-Hale Socks. Pam Wyant reviews the Defeet Blaze socks. Kevin Hollingsworth reviews the Defeet Classico socks. Ray Estrella reviews the Wigwam Wool/Silk Hiker socks. 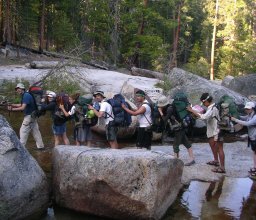 This outings program takes us on a Wilderness Leadership Training course offered by the non-profit group, Bay Area Wilderness Training (BAWT). 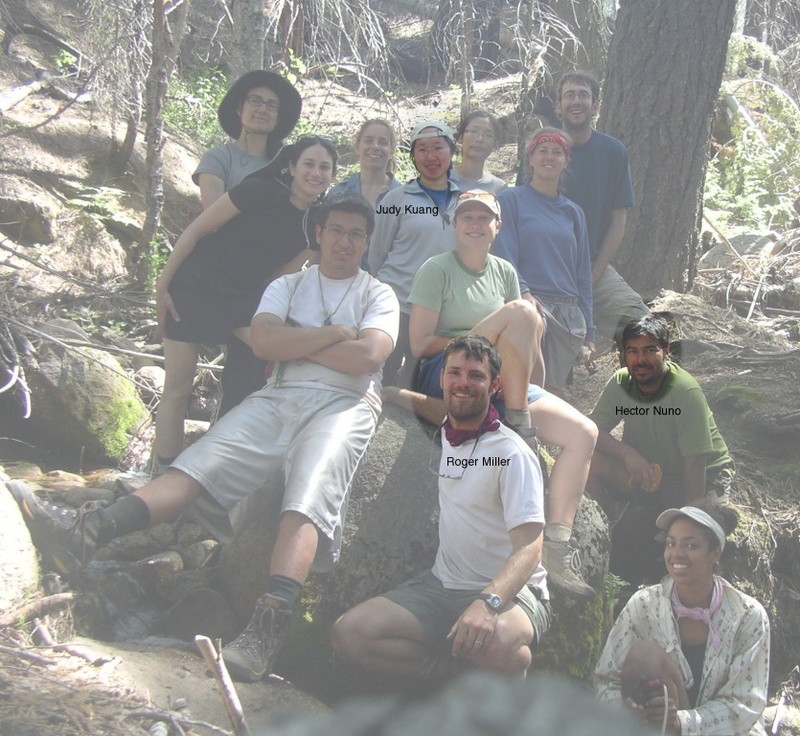 This part 2 of 2 is a follow-up to our original program on ethnic diversity among wilderness users. Roger Miller, executive director of BAWT. Hector Nuño, a volunteer youth counselor from San Jose, California. Judy Kuang, a youth coordinator for the Chinatown Community Development Center in San Francisco. Kellie Meehan, camp director for the Presidio Community YMCA in San Francisco, California. The entire WLT class singing. If you're a teacher, youth counselor, or other youth development professional in the greater San Francisco Bay Area, BAWT's Wilderness Leadership Training can teach you all the skills you'll need to take at-risk and under-privileged youth out on life-affirming wilderness adventures. You can help BAWT with their work by participating in Climbing for Kids. A program that provides you gear and gets you up a major mountain in exchange for your fund-raising assistance. This outings program takes us on a Wilderness Leadership Training course offered by the non-profit group, Bay Area Wilderness Training (BAWT). This part 1 of 2 is a follow-up to our original program on ethnic diversity among wilderness users. We also hear from Chelsea Griffie, program director for BAWT. So what happens to our teachers on the trail? How does BAWT finish the process of turning them into qualified wilderness guides? We'll rejoin them in part two of Bay Area Wilderness Training. This wild places program explores sounds in national parks. Do you go to parks for the peace and quiet? Should you expect peace and quiet at national parks? We hear from Kurt Fristrup, a scientist for the Natural Sounds Program of the National Park Service. 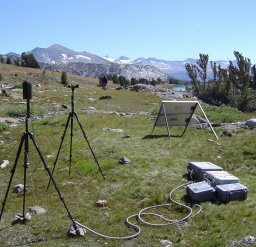 He plays clips recorded by their audio measuring systems, which were placed near Sentinel Dome in Yosemite National Park. He describes the greatest sources of noise pollution in the park, and how it can adversely effect visitors and wildlife. We hear from Dan Dugan, a technical advisor to the Nature Sounds Society, and a noted expert in nature sound recording. Dan explains how you can save some of those natural sounds for yourself, using recording equipment that's comparable in price to a typical digital camera. Dan says, "Unfortunately, quiet places are vanishing fast, and that's one good reason to go out and record before they're entirely gone." The Nature Sounds Society offers an annual Field Recording Workshop in California. For more advice from Dan, follow the Supplemental Information link, below. Members of the WildeBeat can download an additional bonus clip with more sounds provided by the Park Service's Natural Sounds Program, and an additional interview segment on how they do their research. Tom Mangan is another San Jose local who's given us a lot of recognition and behind-the-scenes moral support. 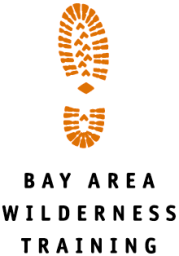 Tom created and writes the Two Heel Drive blog about all things hiking. We want to offer our belated congratulations to Tom for his new job as a hiking columnist for the San Jose Mercury News. You can see the archive of his hiking columns here: www.mercurynews.com/tommangan. Best of luck on this endeavor, Tom, and happy trails!